All human knowledge is relational. What is light without dark? Good without evil? Perhaps free will and determinism, order and chaos, something and nothingness, are simply different sides of the same circle of scientific logic. As science has penetrated the atom, we’ve discovered that solid matter consists mainly of empty space. We’ve discovered that inert objects, such as rocks, consist of particles whirling round each other trillions of times a second. Likewise, believers and nonbelievers in God may both be right, just traveling the same circle in opposite directions. Of course, there have been myriad conceptions of God since the dawn of civilization. There are the Abrahamic conceptions of God, including the monotheistic God of Judaism and the trinitarian God of Christians. In Buddhism, God is almost non-theist. In fact, conceptions of God vary so widely there’s no clear consensus on the definition of God. In short, believers believe God has an incorporeal (immaterial) existence, and that there’s an afterlife. Atheists believe in a strictly corporeal (material) world, and it’s bye-bye when you die. According to biocentrism, a new “theory of everything,” the material and immaterial worlds are co-relative. Life and consciousness represents one side of the equation, matter and energy the other. They can’t be divorced; split them and the reality is gone. Although the current scientific paradigm is based on the belief that the world has an objective observer-independent existence, a long list of experiments shows the opposite. Consider the double-slit experiment: When scientists watch particles pass through two slits in a barrier, they behave like bullets and go through one slit or the other. But if you don’t watch, they act like waves and go through both slits at the same time. How can a particle change its behavior depending on whether it’s watched or not? Biocentrism maintains reality is a process that involves our consciousness. We think life is just the activity of atoms and molecules – we live awhile and die. But biocentrism shows that if you add life to the equation, you can explain some of the biggest puzzles of science. For instance, it becomes clear why space and time – and the properties of matter itself – depend on the observer. How can entangled particles be instantaneously connected on opposite sides of the galaxy as if there’s no space or time between them? And how can events in the present affect those in the past? Recently, scientists sent particles into an apparatus and showed they could retroactively change something that had already happened in the past (Science 2007). Biocentrism says these phenomena occur because space and time aren’t just “out there,” but are tools of our mind. Remember you can’t see through the bone surrounding your brain – everything is woven together in your mind. Those who believe in God believe in an afterlife. Nonbelievers believe death is the end. 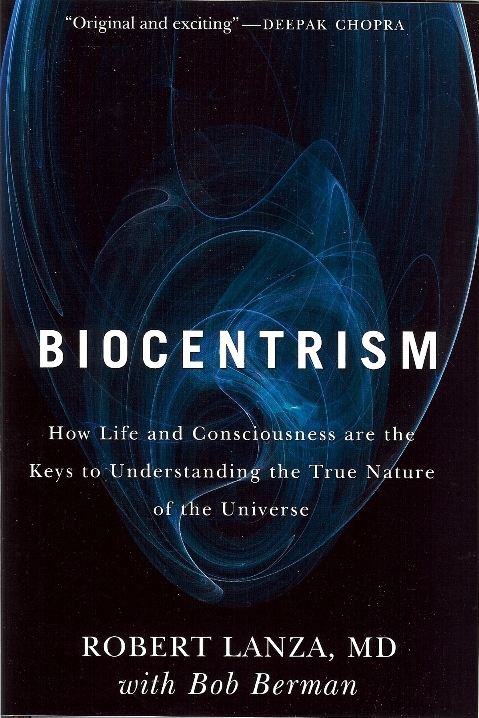 Biocentrism reinforces the primacy of consciousness found in the work of Kant, as well as Descartes, Berkeley, Schopenhauer and Bergson. Without consciousness, space and time are nothing. At death, there’s a break in the continuity of space and time; you can take any point as your new frame of reference and estimate everything relative to it. Like the particles that can pass through two holes at the same time, you can consider yourself both alive and dead, outside of time. According to nonbelievers, you simply die and rot into the ground. The universe continues to tick along like a clock; and in a few billion years, the sun will expand into a red giant, devouring all the inner planets, including the Earth. In one scenario, the universe will reverse its expansion, growing hotter until everything is crushed out of existence. Some theorists say the universe may bounce back into expansion in a “Big Bounce,” and so on indefinitely. In this view, the Big Bang was simply the beginning of one, say, 20-billion-year cycle time. We might be living in the trillionth universe (or any of an infinite sequential universes). Some say this oscillating model is consistent with the Buddhist worldview. Although speculation, it provides a sense of scale: If it takes a gazillion cycles to be reborn, that’s only 70 years out of what (in terms of human comprehension) is essentially infinity — the mathematical equivalent of materialistic death. In contrast to the old mechanical worldview, biocentrism maintains that time is a form of animal intuition, not an object that ticks along independent of the observer. Without consciousness, the passage of time is meaningless. From this viewpoint you never die (see “Is Death the End?” and “Does Death Exist?” for development of this idea). The implications of this were clear with the loss of my friend Bill Caldwell, who died over the holidays of a heart attack after golfing. Bill was CEO of Advanced Cell Technology (where I work), and one of the most decent human beings I’ve known. He struggled against the last day to cure human disease. When the company almost folded, Bill was the only other officer who didn’t jump ship. He refused to give up and believed we could make the world a better place for millions suffering from horrific diseases. Indeed, a few weeks ago we received FDA approval to carry out the world’s first clinical trial to use embryonic stem cells to try to prevent blindness. Accepting responsibility for the hopes of patients, Bill said “We do not intend to let them down.” My regret is that someday patients will benefit from stem cell therapies, but will never know the sacrifices that Bill and his wife, Nancy, made for their well-being. At the viewing, Nancy leaned over the casket, tears streaming down her face. She was with Bill at every step. When the company couldn’t make payroll, she used her own money to pay the employees. It seems like yesterday I was at their wedding dancing with Nancy under the stars in her flowing gown. As Nancy guarded over Bill’s body, surrounded by majestic floral arrangements, I recalled the words of Loren Eiseley: “There remained in his garden only the dried husk of an old plant among flowers reaching for the sun.” But I knew that God or no God, that somewhere outside of our primitive thinking – of any particular spatio-temporal possibility – that Bill missed yet another golf game, and that he, Nancy, and I were sitting on the beach with a bottle of Champagne celebrating our recent success.